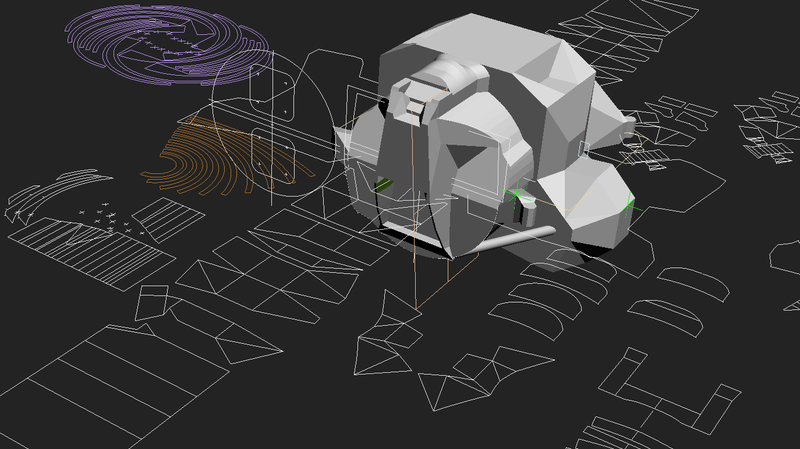 These blueprints are derived from measurements from Vincent Meens excellent LM blueprints and other sources on the net. I used Vincents blueprints to create a 3d model of the lunar lander. This model is then unwrapped and “flattened” so that each part can be printed on paper and then cut from sheets of styrene. Some of these blueprints may have smaller issues but if you print them on paper and testfold them before you use them you will surely understand what modifications you need to do. Mostly removing a little material in the seams to compensate for the thickness of the styrene sheets. 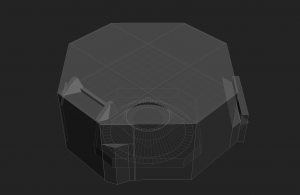 (3d polygons have zero thickness) For some blueprints this compensation is already done but I cant really remember which ones. I only used them once so making them perfect served no purpose for me. They could be a helpful if you just want to build and not waste time mucking about on the computer. descent stage_parts slight error in the ALSEP quad. easily addressed. Very nice work!!! I’m looking forward to watching your progress. I’d like to add your site to my links page. Please go ahead and link! Fantastic work! The flattened blue print is a great idea! I like them. It becomes very much easier when all the parts fit from the beginning. Hope they come in handy! Great idea to use sketchup! Coolest software in a long while. Nice fit on your model there. razor-sharp edges all round! I will do more blueprints when it comes to the panels on the ascent-stage. Mattias, I finally went through all your photos. Your work is really great. Amazing is your progress too.The idea of casting all struts is excellent. In comparison with parts made by Accurate Models your casting look really good. They used computer guided technology. I started drawing several years ago and I am still drawing, drawing and drawing. And I am not finished yet. See http://www.flickr.com/photos/20439668@N00/sets/72157623910601834/ Good Luck! Wow you got some nice drawings there! very detailed. I sure would really like to see more! just keep drawing and drawing! Look forward to your progress and great photos! Your 3d looks really nice. Like the very soft wobble in the rotation of lm5 in the test flight clip. what software do you use for modeling? I’m using a solid modeling CAD software, not so good for animation. I have a lot of Apollo models on the go, hope you can email me, I’ll send you some renders of my work in progress. I want to build one in my back yard, full scale. How expensive is aluminized mylar? You can buy it on 15 meter rolls and they cost about 3000usd a pop. I think that the Decent stage will be a piece of cake, compared to the Assent stage. Are all of the panels shown in the Assent blueprint to scale and if so, what is that scale? Thanx eh! Its 1:24. I stole the measurements from Vincent meens so its data that has gone trough a couple of generations. I like to think that my blueprints are correct. But there might have snuck in some errors in the conversion.